The ALL IN ONE customer support helpdesk allows you to manage various channels like E-MAIL, WEB-FORMS, TWITTER, FACEBOOK, CALLS everything under single roof. If you need a comprehensive solution to support a complex organization, be sure to test Vision Helpdesk. We operate and support the IT infrastructure of the Swiss Diabetes Society in all matters and support its users. We also look after all members of the Swiss diabetic society (diabetics type 1 and type 2) in all aspects of the management of their disease. As an international company, we provide all services of the SDG for charitable purposes for free. Vision Helpdesk helps us allocate all inquiries centrally andwith great efficiency and assign them to the right departments to be able to respond to employees and patients even faster and more efficiently. "Fully customizable / Easy to use / Friendly interface"
Being able to customize the branding to our needs. Tracking of tasks due on a routine basis. Moving from an email box to an actual ticketing software has made it a lot better than before. Some items need a little research to figure out how to implement. I would also like to see the ability to change a user to an admin/staff member, and remove an admin to just a user. As it stands right now, there are basically two different logins for a admin/staff member. If you are not experienced in hosting applications, I would suggest that you either use SaaS or find a host that has an installer for it. I'm moderately experienced but I was running into a few issues that I had no idea on how to fix. We are able to use this system to provide a knowledge base for our users so they can help themselves on easier tasks. We are also using the ticketing system to submit issues beyond the knowledge base scope. The automated ticket creation is a great tool for keeping up on which tasks need to be completed on a regular basis. The ease of setup and intuitively makes deployment, training, and integration simple and straightforward. On boarding new support staff is quick and easy, with the learning curve being very attractive for our environment. Customization for tickets is very good with us being able to provide good scope to our users when submitting their tickets. The clean interface is also fantastic, very big fan of the flat design with navigation being very simple and straightforward. There is nothing that I truly dislike about the product. The only thing that I could recommend for improvement might be with the ability to disable the default username and password login fields when using an SSO solution like 365 as it confuses some of our users. In addition, the default emails that come bundled with Vision make deployment a little bit more tedious. Some CSS to make the emails look a little prettier would be nice, possibly with a global template option versus per-instance. I would also like to see a little bit more optimization on mobile. When we removed our external IT contractor, we required a solution which would allow our employees to submit tickets to us (IT & AVL support) through a central ticket management system. After looking at a few different solutions, we came across Vision Helpdesk and after demoing the system, found it to be very well suited for our needs. Primary benefits include excellent ticking tracking features with great automation functionality for very efficient workflows. "Providing excellent support for external and internal users"
For our Organization we were looking for a registration system for incoming contacts, such as mail, telephone and social media. Also the support of our volunteers and users of our online applications were central to our quest. With Vision Service Desk we found the best solution. Tickets are easy to create by our staff and the origin is registered, giving us statistical data. Because we can identify our hardware and software and can report problems, we can offer optimal support. We had no experience with a service desk program. Our previous tests limited themselves to classic (and limited) helpdesk ticket programs. This inexperience and the extensive possibilities of Vision Service Desk were the biggest disadvantage for us. The online manual is quite limited, so for a novice it requires additional research. Once everything is set up and tested, the program is easy to use. - Registration of incoming contacts (mail, phone, social media, ...) of both external and internal users. - Automatic and manual registration of incoming contacts. - Help desk for technical problems and ability to service requests. "Amazing software with extraordinary service!" It has a brilliant outline when you sign in. You can see everything that is going ahead in your Support Department as far as your clients and their requests. The way that it can be so effectively incorporated with other programming like SugarCRM, Joomla, WordPress is awesome!!! It makes it simple to deal with all from one spot for your Support Team. It's quick and extremely adaptable. It has a crisp look and with the Responsive Design it has, you can even run and work together with your Support Team from your smart phone wherever you are as long as you have web connection. This is truly incredible!! Unquestionably an easy decision!!! Both thumbs up!!! overall, I do not hate anything, yet i've asked for some extra elements like 2 - element confirmation, for instance mix with CLEF, and whether the "index.php?" part could be erased from the URL for better SEO.! You can get everything at one place with this great product! Since this product gives integration with number of other open source arrangements out there it solves the integration of various other solutions for being effectively coordinated as though it's an ERP level solution for your organization while keeping up the adaptability of hosting various solutions on various servers, even distinctive hosting areas. Mobile support turns out to be simple because of mobile responsiveness.! Thank you for your review and suggestion related to "index.php?" - We would check the possibility of optimizing this feature in our upcoming versions. "User Friendly, Versatile Help Desk"
With Vision Helpdesk you are able to manipulate it to the fullest to use it for your needs. With my organization, our biggest need was the need for a knowledge base built in and Vision Helpdesk has great tools built in to help better your articles! Some of the features we needed to do some research to find and setup properly. We are using Vision Helpdesk primarily to allow our users a one-stop shop to look up information quickly without waiting for our team to respond to them. Vision Helpdesk also enabled us to move away from the shared mailbox realme and into the much-needed ticket system to track all emails correctly! "A very good and simple helpdesk ... we need it"
It is very difficult to assess what is best, if I were to describe it in one word, I would say: integration. The most important in the work of the press editorial is efficient communication, thanks to the integration of several communication channels, we no longer have to think which message was last ... all in one place ... We have had this for a long time. The possibility of integration with SMS providers in Poland, eg SMSAPI, and a greater number of integration and single sign-on capabilities (SSO) would definitely be useful. The rest is as it should be. Above all, we managed to solve the problem of out-of-date messages (now we know who wrote back to someone ... earlier there was a mega problem, it happened that we responded to 1 e-mail several times.) Communication in Editorial Office has improved significantly, but our readers see results, now instead of waiting 3 days for it to be checked by an e-mail, they receive a reply within a dozen or so hours, often even a few minutes. We like the gamification at Xenon Cloud. Our reps can compete against each other in a fun way to complete helpdesk tickets. We also like the ability to integrate with apps we currently use such as our billing platform and accounting software. We have not discovered something we disliked about this software. We are solving controlling the infrastructure our helpdesk is hosted in by using the downloaded version of vision helpdesk. We used to use Zendesk but could not control the instance it was installed on so we are very happy that there is a helpdesk we can control. "Great Product with lots of integration possibilities"
We have investigated quite a few products but found that Vision Helpdesk has both design & features that make it stand above the others which seem to have one or the other. The support offered during our test period was always very friendly & responsive allowing us to get the system installed "in house" which was one of our requirements. We also found the pricing to be affordable for the power the system gives us. The documentation is a little "light" in places but this wasn't really an issue as all we had to do was to ask support for help & they provided the information we needed. If implementing "on premises" version make sure you have some Linux experience and needs quite a few extras to install. Make sure you watch the installation Videos as they provide lots of helpful information. We have been using a "home brew" ticket system that is over 15 years old now & it was struggling to cope with the size of our establishment. Staff were missing jobs or they were being duplicated wasting resources. We could also not generate reports so hard to justify how busy the department is without this. With the Vision software we are able to streamline systems & also for the first time offer users the ability to view how tickets are being processed & where how their jobs are proceeding. Vision Helpdesk provides an intuitive, fully featured Helpdesk platform. After investigating several other platforms, Vision Helpdesk seems to offer the best price-to-features ratio for our needs (a significant benefit is the fully responsive interface). The software is also available in an on-premises version, which is essential for us and sets it apart from many other products which are now cloud-only. We particularly like the built-in workflow functionality, and the capabilities to easily split and merge tickets. While Vision Helpdesk is generally very intuitive, their documentation is a bit sparse. This probably wouldn't be nearly as much of an issue if going with the hosted version of the product instead of the on-prem version. Fortunately, Vision Helpdesk's support department is responsive and helpful. We would also like a bit more of the code base to be open-source; much of the product's source code is encrypted with Zend. If you're installing on-premises, be sure to have a competent in-house IT team or consultant to do the installation and upkeep. Be prepared to do a bit of testing, experimentation, and trial-and-error (as Vision Helpdesk's documentation is not always the most helpful). Vision Helpdesk provides us with an easy way to manage and track support tickets for our organization. This helps us to be more efficient and ensure that all of our support needs are handled effectively. The knowledgebase is also an effective tool to easily disseminate technical information to users and reduce helpdesk calls. "Great Helpdesk Software and Knowledge base"
Many features in a compact design, very good overview. Special designed for easy use, That is for the admin site as well as the very nice portal. Therefore like the best is not easy to say. So many things. Anyway: Compact good overview and designed as it should be. I don't have or see any issues yet. And if there are new coming i will make a request. Documentation could be better, use it in combination of screenshots, samples, too mine opinion that's the most effective nowadays. My advice should be deploy in cloud, then you can do it without any IT knowledge. Further settings is done in a nutshell. Perhaps not the usual business, but we are a soccerclub, we have about 1500 members. We are using it for questions, knowledge base, and ticketsystem. We can't make appointments to speak to every member, we try to help the members in a modern way. And this way we can help everybody as we like and most of all, our members like it, even competitors. I have been looking around for many years, but this solution fits all the needs we have. VisionHelpDesk doesn't provide unnecessary features, all they have is all we need, all they provide are used by general user, anyone can configure it easly. it also provide easy access menu, very helpful !! The responsive design must be improved little bit, especially for Replying ticket page. Then the custom field options must have other options. Also for Form Building, we can't set "is_required" for all field types. As a non-profit organization who help animals to get new home, we need platform to manage adoption candidates as easly as possible, and provide Animal Abuse Report as easy and as fast possible. I like the way the interface is structured. I like the fact that its web based. After the setup process its was pretty much an easy process to go from there. Updates to tickets were sent in Email to users. Office 365 integration was really great. My users are all able to login using their office 365 credentials. I dont like the Zend Encoding, as it makes it a lot more dificult to install. It got me a bit frustrated when I kept getting same page over and over again. Also the videos online on how to install vision helpdesk did a great deal. Users sending request through ticketing. The inability to track tickets sent by users as also been solved using vision helpdesk, as users are able to track status of their tickets. Also users are ale to create new projects for different departments and as well follow up with request . Vision Helpdesk has a great deal of configurable features that allow it to be very adaptable to business needs. The support team has been very helpful in helping us adopt the product. Contacts from non-email channels can't automatically become conventional tickets. Some component occasionally requires logging out and back in so you can reply to tickets, though they say this will be corrected soon. Wait till spring of 2018. Have processes in place that you want implement. Support currently, evaluating for customer service. 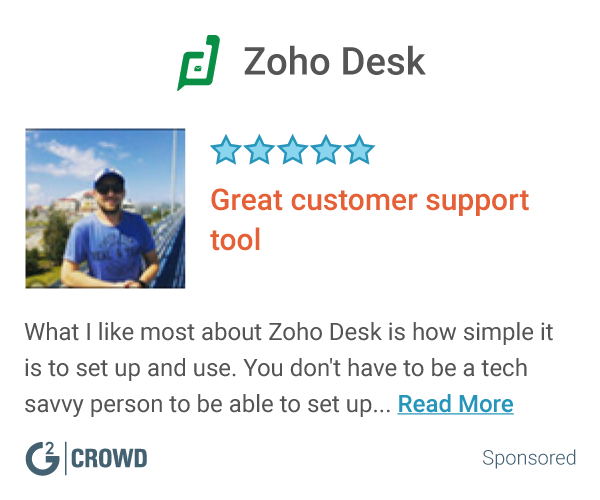 "Best affordable Helpdesk System I've found so far." Their portal is fully responsive which works great on any device. It's very easy to use and the best thing is that you can customize almost every factor of the helpdesk system. Their support is also very good. They respond quickly and they always have a solution for your questions and issues. Lastly, their app integration options are huge which it makes Vision Helpdesk the best affordable solution on the market. I would highly recommend the product. Their system is definitely recommended for any business either big or small specially because of all their flexibility of integration. For me, the're the best! Having a help desk system really helps me organize my company's workflow and my customers are happier than ever because all the communication happens in one place. I have been in the market for the perfect solution for us for quite some time, I would have to say one of the items that stands out to me is how well the software integrates with email and other avenues of getting calls from users. Lots of other solutions are not very good with putting conversations together and the ability to merge everything to one incident. The application is very customizable and flexible but I would have to say the Downloadable install is not very user easy to install. BUT when I reached out for assistance we were able to get it installed the very day. This application offers lots of features others do not even have. Considering all the integration offered this is a great value. "Best Helpdesk System so far"
The Vision Helpdesk Software is a very easy to use and modern locking helpdesk system. It offers me a lot of options to include messages from different sources (E-Mail, Facebook, etc.) and groups those tickes in custom departments, which are easy to select / filter on. I also tried other competitive products but none of them had all those features in such a great UI! As a non profit organisation we get E-Mails from our sponsors, donors and also members. To work on those tickets and replaying to them with multiple staff members, we need an easy and simple working helpdesk solution. "Best affordable ticket system i seen on internet"
Firstly - its design. It`s responsive. It`s minimalistic. It`s understandable for all kind of people. Secondly - it`s functionality. Comparing with other services it costs much, much more for same functionality. Thirdly - support. It`s best support i seen on market. They in 15min helped to resolve my problem with system installation problem. Next i liked about system - it`s possibility to change design colours to match company`s style. One more thing - it`s timer. It is important for us, because we are service company. And yes, it is multilingual! Our company is managing computer, tablet and mobile phone service, so we need platform for ticket questions, i managed to look all found in google variants, and Vision Helpdesk was most affordable with maximum functionality. Now we are using Helpdesk plan, but in future we will upgrade to Satellite plan, when we will service other companies. "Vision Helpdesk - user friendly and easy to use tickceting system"
What I like best about Vision Helpdesk is the ease of use! Once you log in, everything is labeled and it's very easy to navigate through the software. One thing in particular that we were looking for was a customizable user portal, and that is exactly what Vision provided, we were able to customize the portal to have the custom fields that were necessary to our requirements. Also, the support documentation available online for the helpdesk is great, along with the support staff, responded to my inquiries promptly. One thing that we had a little trouble with were some of the reporting functionalities provided by Vision. We needed a report with some specific fields that we could not find within Vision but we contacted the support team and they informed us that a new version of Vision would be rolling out with the report fields we needed. The business problems we are solving is managing projects for external clients, where they are directed to submit tickets when assistance is needed. The benefit with using Vision is that everything is in one place and our staff members have access to see what the client has requested. Vision helpdesk is FULLY customizable - the system has so many features and ways to customize it's great! The UI is not that visually appealing. It's very functional, but not great to look at. We're using Vision helpdesk as an internal ticketing system to manage work requests and projects. It's been helping us get much more organized and gives stakeholders a way to view the progress of their requests. Thank you Lane, for taking time to review Vision Helpdesk. This year (anticipating first quarter) we are coming up with a new version V5. The new version is going to be a complete responsive design and a fresh approach to ticketing interface. We will post more updates soon we are close to release date. "One of the best IT product i have ever come across-vision Helpdesk is highly recommended "
I felt its UI is pretty neat and clean, completely functional product is there in the offering. Experience remained a very good one right from the demo, followed by sales, installation and now in maintenance phase. I think vision helpdesk staff members who supported us during installation and in other stages made a big difference. Big thumbs up to them. Felt documentation can be more structured. They have all the information, however felt it can be sequenced and structured better. In Vision helpdesk we found it to be a cost effective preposition which delivers up to the mark features. It enhance the complete brand of an organization. Stronlgy recommend to others who want to invest in meaningful product and comes with several tangential advantages. With helpdesk we are and look more complete as an organization. Customers are a happier lot considering instead of mails they can raise ticket and followup on the same using helpdesk only. Within our team, things are structured, accountability is set properly and customer is provided support as per the SLA defined. Simplicity, Design, Features is what sets Vison Helpdesk apart ! Support has been excellent and we are very happy to be associated with them all these years. Kudos to the team Vision Helpdesk. Any issue or question is answered almost immediately. Easy to manage all support from one place. The support staff at Vision Helpdesk are excellent, they allow you to add them on Skype and literally guide through step. I am looking forward and wish the team good luck. Vision Helpdesk is great product! Never ever we have faced any problems so we have nothing to dislike. We are a web hosting company, started 2005 and had searched for many free and paid helpdesk softwares but the decision to choose Vision Helpdesk was the best and has been a very pleasant journey from V2 onwards.We're using Vision Helpdesk to manage support for our brand and the overall experience has been very good. They offer everything that we need to manage customer support. "One of the Best Help desk Software for Web hosting Industry!!" Webhost.UK.Net has been in hosting industry since 2003 , in our business customer support is one of the most important aspect. Before using Vision Helpdesk we used Kayako. Vision Helpdesk is easy to install, simple to configure and use for our support staff, Apart from ticketing features our team frequently use Vision Helpdesk Blabby feature it helps our staff to collaborate and share knowledgebase among team members. The latest V4 version has got fabulous design with ITIL/ITSM Service desk / enterprise features at economical pricing. The only thing missing for us is live chat software , but as per our discussion with their team it seems they are working on it and should launch there own chat software.we would love to have livechat option in vision helpdesk itself.. If you are looking for cost effective and useful help desk software with lots of features and integration and customization possible Vision helpdesk is right choice for you. We are from Web hosting business where we get regular ticket to our sales, support and management , or priority is getting fast active support to our customer, which is possible setting Vision helpdesk SLA rules, using blabby staff member from our different office location can discuss thing internally using vision helpdesk without having the need of any additional software. Even their multi company satellite helpdesk is big plus for our reseller hosting customer for whom we offer white label support under as their company support techs, its possible only in Vision Helpdesk. "The most user friendly helpdesk ever!" The client portal is so user friendly compared to our previous software. The features are endless. Our employees have a wide range of technical skills and every one of them can use this application without any difficulty. It took a little more work on the setup than I expected, but it was worth the wait. Allow yourself some time for setup to be able to explore all the advantages before rolling it out. We are keeping our emails free from the constant requests for help. It really keeps requests from getting lost in the shuffle or forgotten about. Faster receipt of tickets leads to faster resolution of problems and better service to our clients. This program makes it really easy to turn replies into macros and solutions so it's easy to respond to customers quickly. Settings are fairly complicated. Then again, there are a lot of integrations and options. Integrates with a lot of other platforms. We are a non-profit who serves foster parents. We are using this ticketing system to quickly communicate and support caregivers and using our responses to start compiling a knowledge-base so they can find answer even more quickly and easily in the future. "Very Reliable and Robust Helpdesk Software"
What I like best about the software is that it is pretty much straightforward in terms of overall management. The user experience design is very fluid and the actions and navigation are not convoluted. Ease of use is very apparent especially for the clients, they even get to see the knowledge-base before submission of a ticket. Captured all the data we need to better manage our helpdesk. I think there is still room for improvement in the documentation aspect. However, the customer support is excellent and consistent. Monitoring and timing tasks as well as complying with SLAs. We realized that with Vision helpdesk, we can automate almost every scenario we can think of in addressing our needs. I like the clean interface and responsiveness of the cloud offering. Have not experienced any lag or timeouts. it almost feels local. There are many integration options I look forward to trying. No dislikes. There are a lot of options and things to work through though. So if there is a down side that would be it. Do the trial when you have some time to dedicate to trying features. Very feature rich. Prioritizing and reporting on HelpDesk tickets. "Vision Helpdesk is the perfect fit for any company"
Vision Help desk has one of, if not the best and cleanest looking dashboards out of any of the help-desks that we trialed. It also shows who is logged into the staff portal and how long they have been logged in which is great for productivity productivity tracking. The interface is otherwise very intuitive and allows you to change themes or color palates to match your organizations color scheme. We chose the self hosted product and the installation wasn't as straight forward as I had hoped. I will also say that the install directions must be followed to the letter otherwise some options may not work or may render incorrectly. We were using an open-source helpdesk earlier in the year which suffered a major data loss and left us scrambling to find a new solution with commercial support. The features and benefits of Vision have helped us to get back on track and fill our internal support needs. "Best collection of usefull features. Easy and strait forward to use." I looked at over 10 different help-desk providers. I tested each of them that offered trials, and compared each of their feature sets. Vision Help-desk was in my top two. Their better features, which included sending of basic invoices to customers, and their helpful support department made their product the clear winner for us. It has been worth every penny, and will continue to help us support our customers and save us money. A few unrefined features in billing department, but they are planning on improving it. I would not it is mainly the billing features they do have that made me choose it over other help-desk software's. Try it out and you will find it easy and quick to learn. Its cost is competitive and worth every penny. It will save you from loosing customers, and will help you bill them and collect! A few important benefits to our business that Vision Help-desk have helped to solve are first, it helps us stay on task with customer's problems, by keeping us aware of past problems as well as keeping us more responsible with their current ones. "Vision Helpdesk - Great Solution"
Easy to install using Softalicous self-hosted on our cPanel server. An immense amount of configuration options allowed us to set it up exactly how we needed it. Would be helpful to have more guidelines on optimum logo and favicon sizes and being able to configure a theme across both client and manage portals - but a very small dislike really. Centralised management of support issues allowing team to work together much better, avoiding duplication for effort and increasing end-user satisfaction. Compared Vision helpdesk with other products and we selected Vision. It has a clean professional look andsupport all features we require. Glad Vision Helpdesk is right tool for you, Thank you for your review. "Awesome ... Everything in one (1) place ..."
It has a magnificent overview as soon as you log in. You can see everything that's going on in your Support Department in terms of your customers and their requests. Also the fact that it can be so easily integrated with other software like SugarCRM, Joomla, WordPress and so on is great!!! It makes it very easy to manage all from one place for your Support Team. It's fast and very customizable. It has a fresh look and with the Responsive Design it makes it even possible to run and collaborate with your Support Team from a smart phone wherever you are as long as you have internet connection. This is really great!! Definitely a no-brainer!!! Both thumbs up!!! So far, Ido NOT dislike anything, but i've requested some additional features lilke 2 -factor authentication, for example integration with CLEF, though and also that the "index.php?" part could be removed from the URL for better SEO. Definitely recommended for start-ups and Low budget integrations due to the flexibility of integration. Since this software provides integration with many other open source solutions out there it solves the integration part of different other solutions to be easily integrated as if it's an ERP level solution for your company while maintaining the flexibility of hosting several solutions on different servers, even different hosting locations. Mobile support becomes easy due to mobile responsiveness. Has a ton of features that put it on par with even some of the major hosted providers. Extremely customizable, and support is very helpful via chat. There's a ton of integrations which makes this a well rounded product regardless of how a customer wants to open a ticket (i.e. email, portal, facebook, etc). For the price, a really great product! would be nice to see an easier way to integrate into WHMCS, but I know this is something they are working on, so really looking forward to this. Reports, assignments and customization are easy to use, and the support team at Vision were super helpful in getting us started on the right foot! User login could be more flexible, ie cannot use corporate emails. It would have been a plus if users could login once in an easy fashion and not be required to re-enter their email address each time. This could save on important entry errors. Excellent software with excellent support staff to help you out on the right foot. IT troubleshooting convenience, office room booking, and marketing requests taken in an orderly fashion. IT helpdesk ticketing system . "An easy to use helpdesk for our family or schools"
The whole experience has been designed in a fresh and engaging way that makes it easy to navigate. There isn't much to not like, but we have technicians who have a time slot in a certain school each week (Monday afternoons). It would be great if we could configure an SLA to say problem Y needs to be fixed in X hours but the timer only starts/stops when a technician is due in. We have 3 departments that will be using this software, HR, Finance and IT. It has helped massively for our teams to be able to communicate with each other and see which tickets needs resolving. "Excellent Helpdesk software which has all the features!" The interface is easy to use and the love the fact that we can create and track tickets via email! The server installation was easy! There is not much I dislike The learning curve is not steep but we are adapting our procedures to match the software. We are creating a better customer experience for our clients. with better follow up! "Western Chan Fellowship uses Vision Helpdesk :)"
Handling tickets between a distributed small set of volunteers that staff the admin functions for the Western Chan Fellowship. Vision allows us to work together asynchronously and across distances and different access endpoints and technologies. Thank you for taking time to post your valuable review, regarding PHP 7 support since there is no zend guard loader available we are not able to use PHP7 for now. In our upcoming V5 version we will be using Ion cube loader for download which has a support for PHP7 and latest versions. Vision Helpdesk has been a great tool for us. I run a small IT Business and having a tool like this works great. Their support team and sales team our great also. Make sure your server will allow outside access to SSL for pop3. We had an issue with our server which we were able to fix. I would if you plan to host the product on your own do a downloaded trial and see what you thank. Were being able to keep up with all our support cases, etc. "Great software with great service"
Vision helpdesk has assisted the non-profit that I represent to manage the large amount of queries we get from the public in a simple and easy to manage way. The software itself is simple and easy to operate allowing us to set up the required elements necessary to match our needs. The customisation of emails and client portal allows us to keep a consistent brand while requiring little time spend editing the look and feel. The software is fantastic but what really sets Vision helpdesk apart is the support. When I reach an issue or have a question I am given feedback almost immediately. The Skype channel is particularly useful as it allows me to have a conversation vs an up and down email discussion. There are a few functionality issues that I had to find workarounds for but given the short development cycles I am confident that the solution will involve in the future. As a non-profit that is run by volunteers it is difficult to handle all the incoming requests. In the past requests and queries came through to an email address which one person answered. We had no oversight as a board as to the tracking and responses. Our need was to have a central place where multiple users could access and work on tickets. We also wanted to build a knowledge base as many requests end up with the same answer. Multi mailbox view was very nice, you could see a combined but also a separate view per company. Make sure you do your research. This is a good product but I wouldn't say it's the best. Required a helpdesk for internal staff. It helps us quite a bit to separate out mailboxes as we're a multi tenant IT support. Can you please verify your account with us? Your license domain name please. I like best how Vision Helpdesk streamlines the process of tickets, and allows each of my agents to solve problems quickly. I don't have to answer many questions as most of everything is automated. I don't have much to dislike, just the price might be a bit high for some people. Problems I am solving include ways for customers to contact our support team without emailing our email address. Everything is a lot more organized and we can automate much of everything. Vision Helpdesk is great product! The SLA management is fantastic and lets you build nested levels of support to ensure we know only meet our SLA’s. Vision Helpdesk is the best product on the market helpdesk system. - add more reports for client module. I provide service for develop free drupal based site. Help Desk Vision help me to support all my user. "The best in helpdesk software"
I Have a effective workflow now. "Great software for our needs!" We were looking for a new work order system for our organization- we really like Vision Helpdesk and look forward to years of continued use! Nothing, it's great! I wouldn't change a thing! The ease of use, simple to deploy and fantastic support from the development team. There are a number of competing products in this area, but I've found Vision helpdesk to be one of the easies to use. Nothing to report as of yet, a great product! Thank you for taking time to share your experience about Vision Helpdesk. The system is easy to use, has lots of options, and the staff are always ready to help when needed. "For me - it's the best helpdesk software!" No polish language - but I translated it! * We monitor all Vision Helpdesk reviews to prevent fraudulent reviews and keep review quality high. We do not post reviews by company employees or direct competitors. Validated reviews require the user to submit a screenshot of the product containing their user ID, in order to verify a user is an actual user of the product. Hi there! Are you looking to implement a solution like Vision Helpdesk?